When jewelers talk about INSTORE magazine, one word come up a lot. Love. (Sometimes, it even comes up two or three times.) 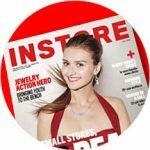 Since its debut in 2002, INSTORE has been the most-loved and most-trusted publication for American jewelers. If you haven’t seen us yet, start your free subscription today to see why we matter so much to your fellow jewelers. See the latest edition of INSTORE in digital flipbook format. What are you waiting for? Start your free subscription today! Simply put, it means a complete, single file ready to be printed. That means, you provide us with a single file in which all your text and graphics have been laid out and rendered exactly as you want in the final product. Fonts should all be rendered and flattened into the final image file. For INSTORE Classifieds, please send files in CMYK, JPG or TIF format, at 300 DPI or more. For a guide on sizing your display classifieds, right-click and download these sample files. All files should be set to 300 DPI or more and saved as high- to maximum-quality JPG files. In the battle for your customers’ attention, there’s nothing like print to allow you to penetrate deep into a market. Especially budget-friendly classified print advertising in INSTORE, the jewelry industry’s only major trade publication published monthly. INSTORE presents three marketing options to help you cost-effectively reach more than 22,000 jewelers — elegant gallery advertising, high-impact display classifieds, and informative text classifieds. Select your tool to achieve your marketing goals … with a little help from INSTORE. Send us your artwork and our team will create your attractive, cleanly formatted gallery advertisement. Take control of your message with a display advertisement of your own design. State your message clearly to the market with a text classified.